this recipe of lasooni palak dal fry has spinach added in good amounts. 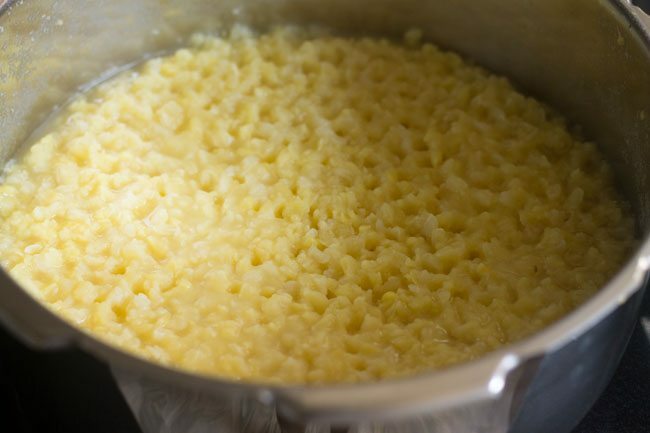 the dal is also tempered with lots of garlic. so you get a garlicky flavored spinach dal. 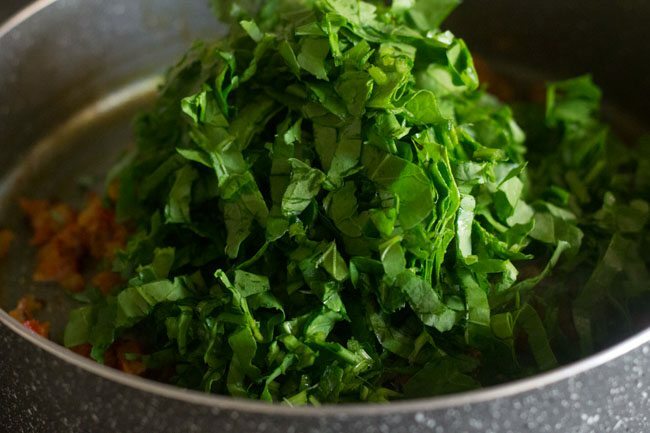 lasooni palak dal fry recipe with step by step photos – dal fry is a soupy lentil preparation. 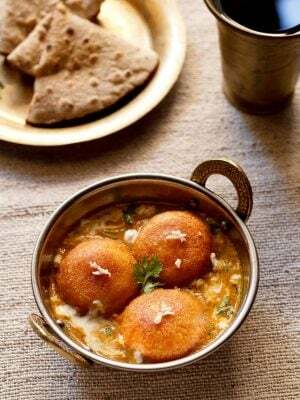 there are some variations that can you do in a basic dal fry recipe. this recipe of lasooni palak dal fry has spinach (palak) added in good amounts. 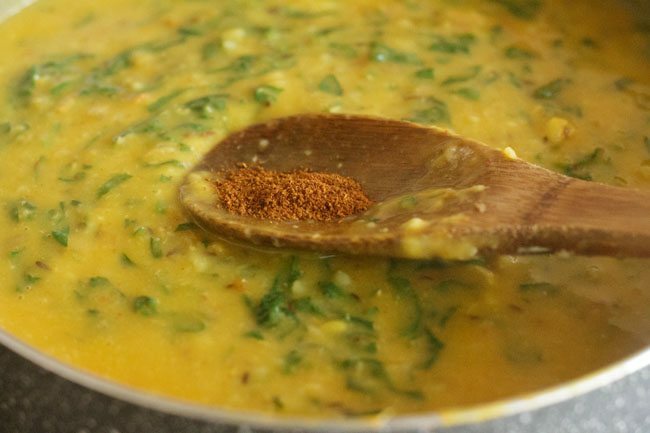 the dal is also tempered with lots of garlic (lasoon or lahsun). so you get a garlicky flavored spinach dal. 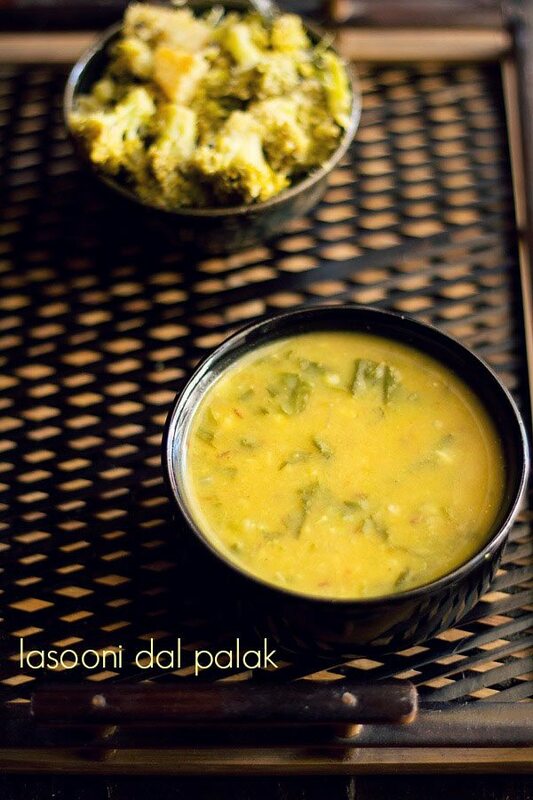 like all dal fry recipes, lasooni dal palak can also be served with chapatis or bread and steamed rice or jeera rice. 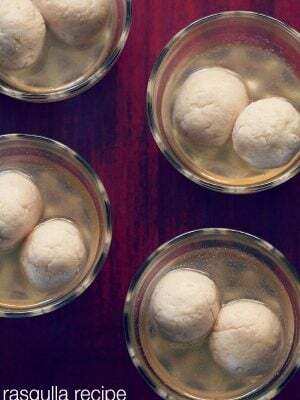 i have used moong dal (mung bean lentils) in the recipe. 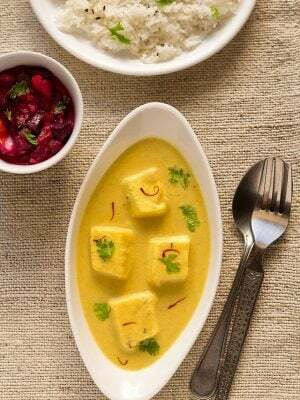 you can even use arhar dal (pigeon pea lentils) or masoor dal (orange lentils) or a combination of 2 or 3 lentils. 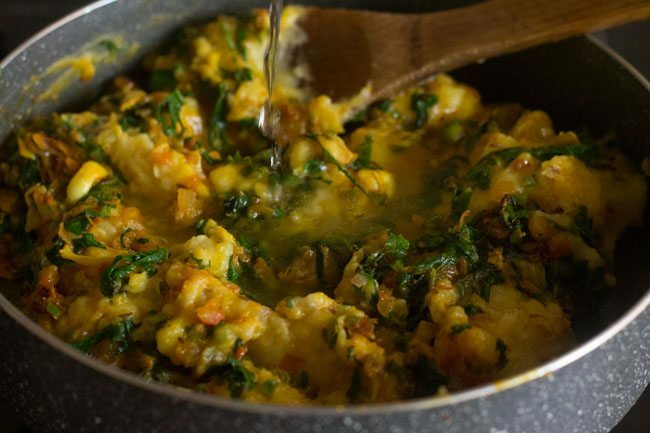 so lets move on to this healthy recipe of lasooni dal palak . 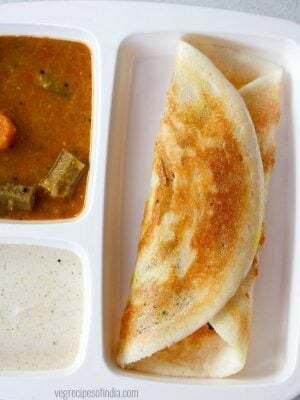 if you are looking for more dal recipes then do check lasooni dal tadka, moong dal fry, arhar dal fry, palak dal, chana dal, dal makhani, sabut moong dal and dal tadka recipe. 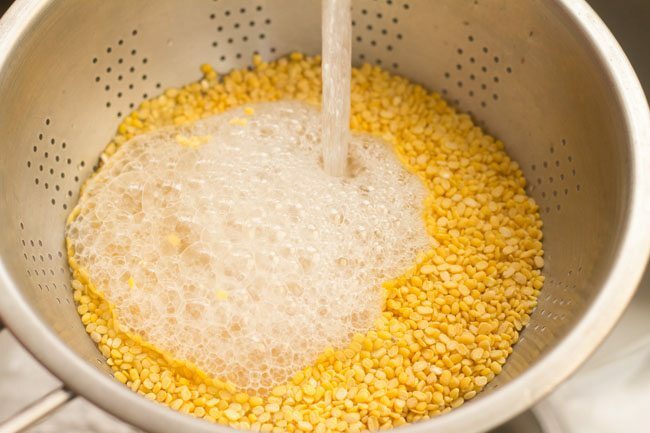 rinse ¾ cup moong dal in water for a couple of times. then add the lentils in a pressure cooker along with 2.5 cups water. pressure cook the lentils till they have softened completely or for 6 to 7 whistles. 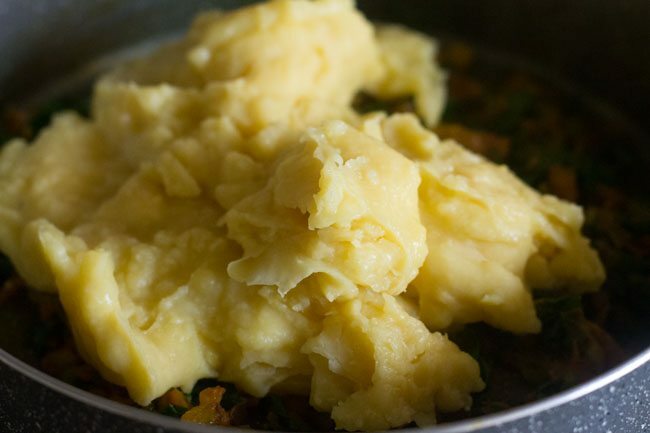 mash the dal with a spoon and keep aside. 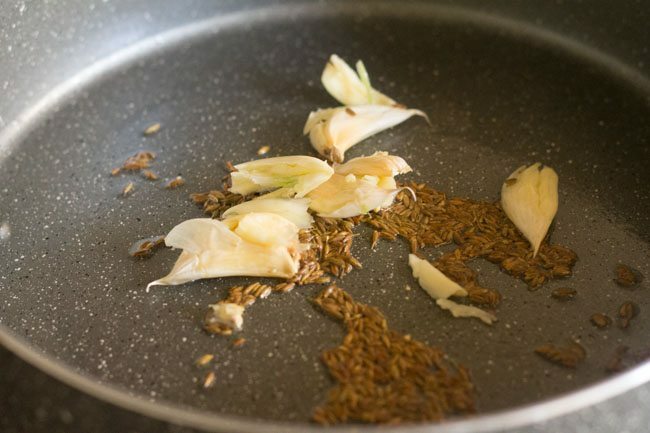 when the lentils are cooking, crush the garlic cloves lightly with their peels on. finely chop the onion, tomato and keep aside. also chop or slice the green chili. 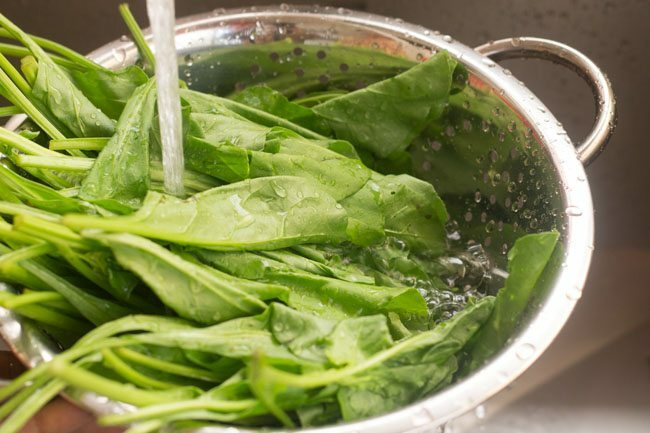 rinse the spinach leaves very well in water. then chop them finely. heat 1.5 tablespoon oil in a pan. 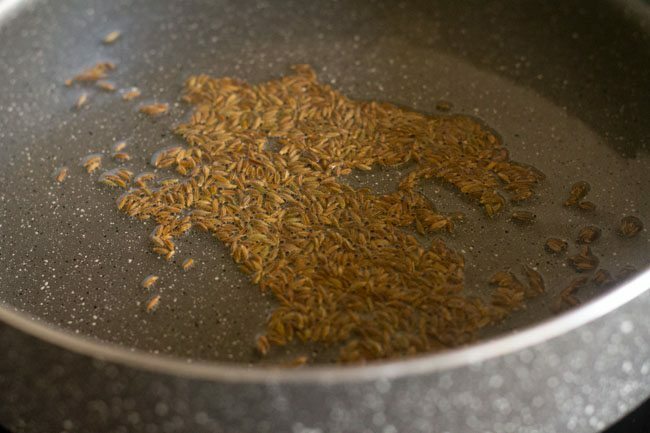 add 1 teaspoon cumin seeds and allow them to splutter. 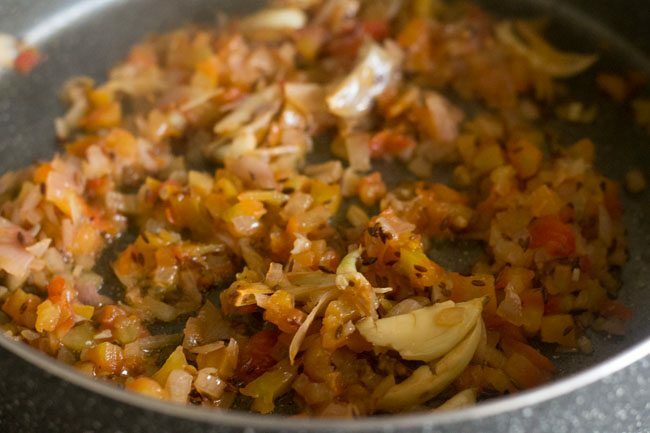 then add the crushed garlic cloves and saute till they become a light brown. 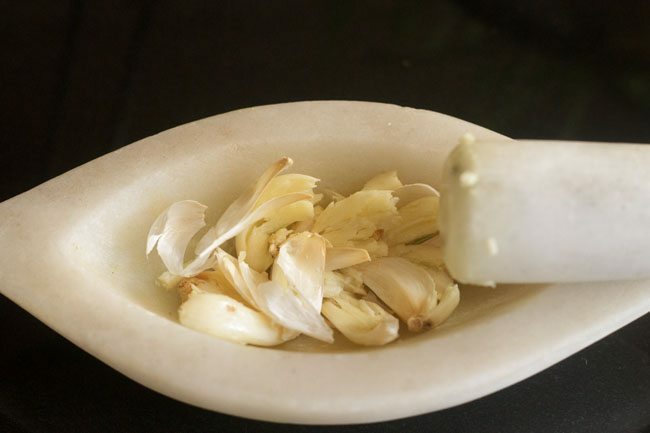 you can even saute the garlic for some seconds without making it light brown. then add the chopped onions. 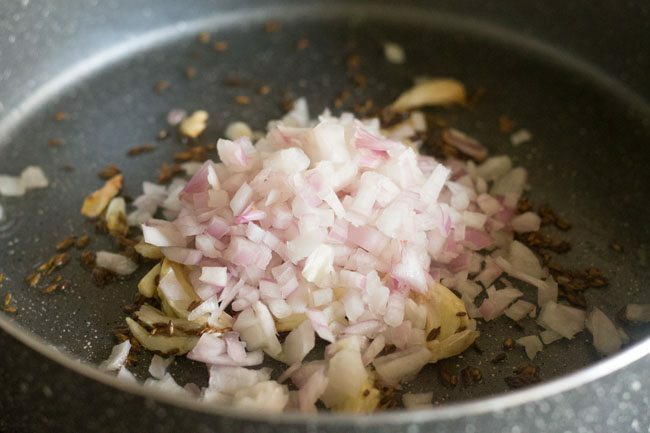 saute the onions till they turn translucent. next add the chopped tomatoes. saute till the tomatoes become pulpy and you see oil releasing from the sides of the mixture. 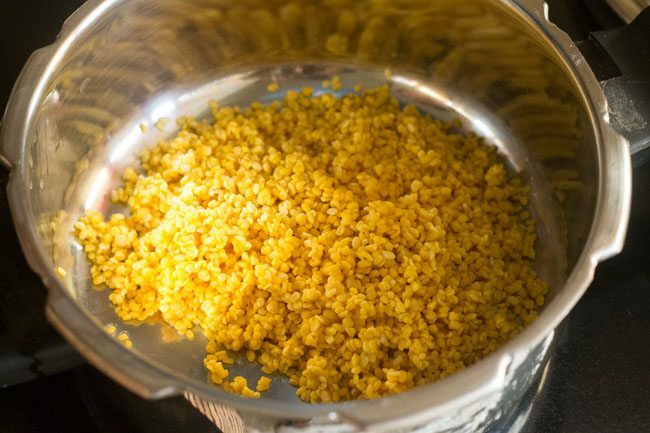 now add the spice powders - ½ teaspoon turmeric powder & ¼ or ½ teaspoon red chili powder. mix very well. add the chopped spinach and green chilies. mix well and saute on a low to medium flame for some minutes till the spinach wilts. now add the mashed dal. stir well. for a thicker consistency of the dal, you can stop here. 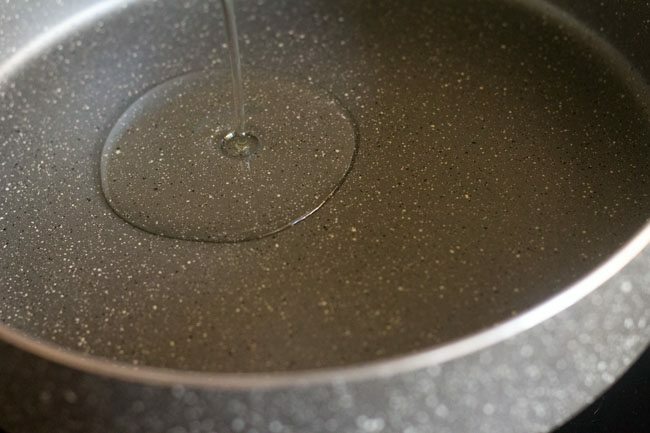 for a medium or thin consistency, you can add ⅓ to ½ cup water. add water depending on the consistency you require. 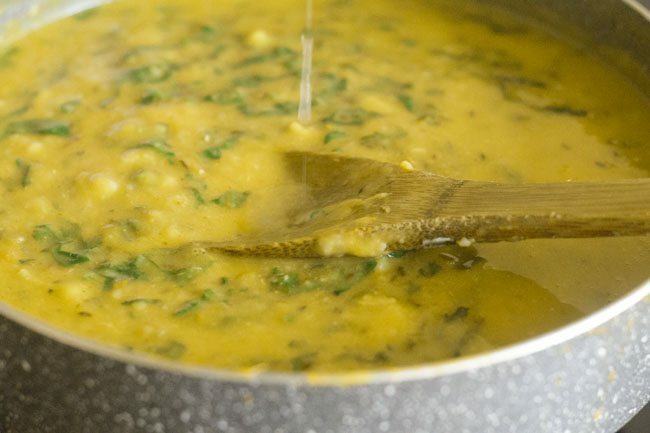 stir well and bring the dal to a simmer. lastly add salt as per taste. 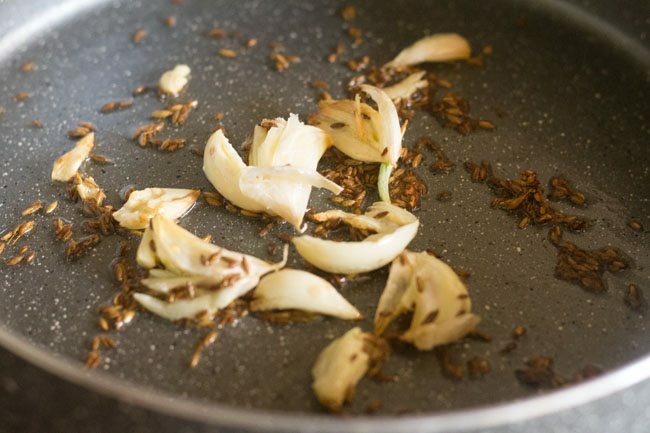 once the dal is cooked to the desired consistency, sprinkle ¼ teaspoon garam masala powder. 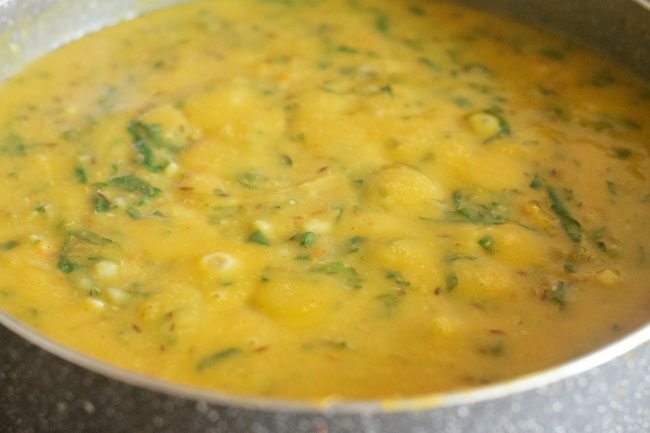 you can also add a few drops of lemon juice to the dal. 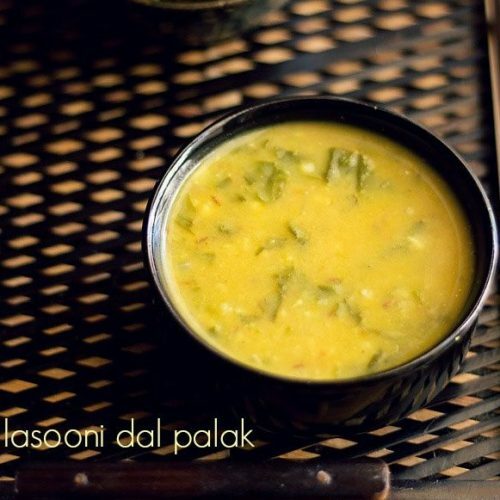 mix well and serve lasooni dal palak hot with some chapatis, phulkas or steamed rice. 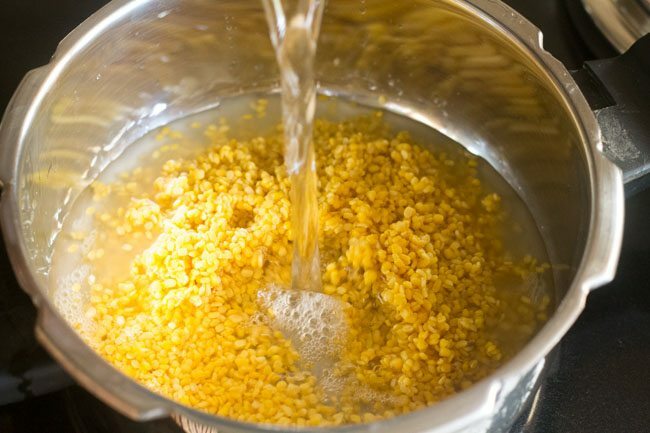 1. rinse ¾ cup moong dal (yellow lentils) in water for a couple of times. 2. then add the lentils in a pressure cooker. 3. next add 2.5 cups water. 4. pressure cook the lentils till they have softened completely or for 6 to 7 whistles. 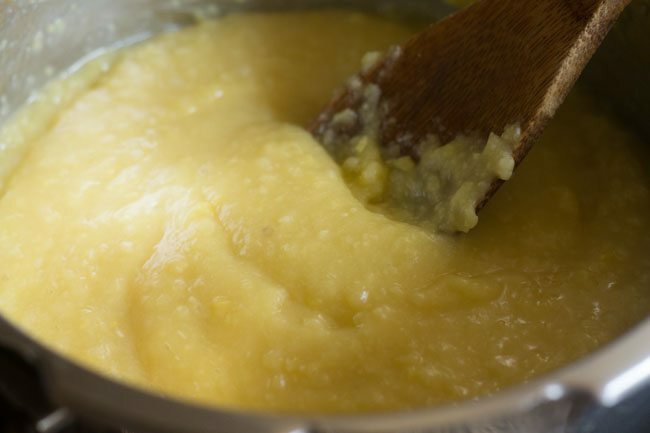 5. mash the dal with a spoon and keep aside. 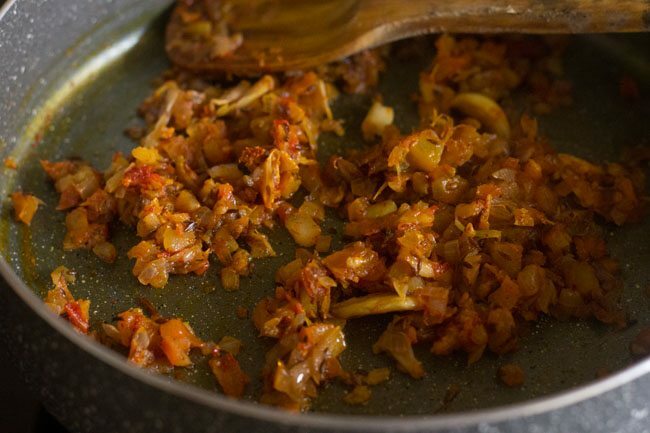 6. when the lentils are cooking, crush 7 to 9 medium garlic cloves (lahsun) lightly with their peels on. 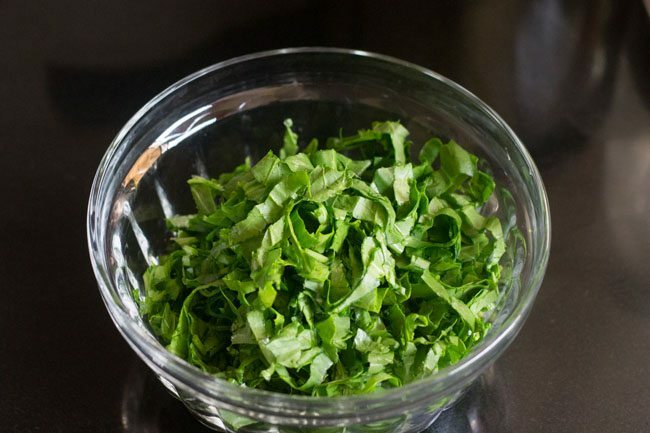 7. rinse 1.5 cups spinach leaves (palak) very well in water. 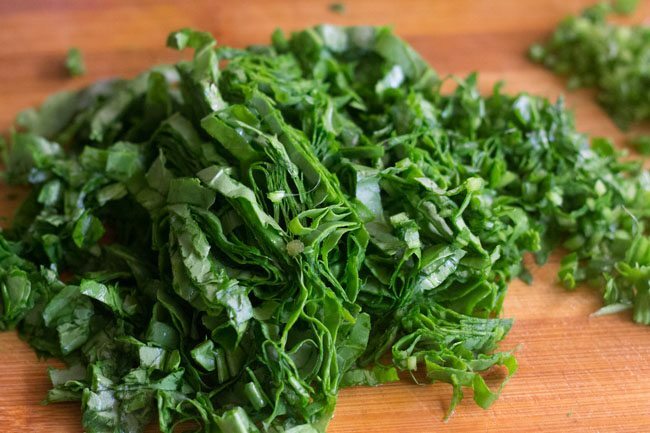 8. stack some spinach leaves then chop them finely. 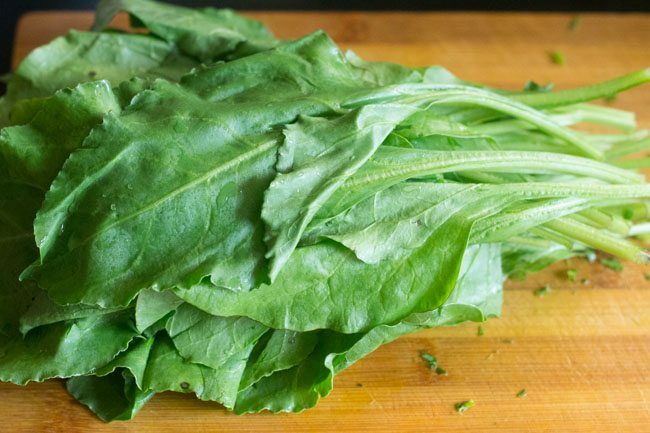 stacking leaves helps in chopping spinach leaves finely and takes lesser time to chop. 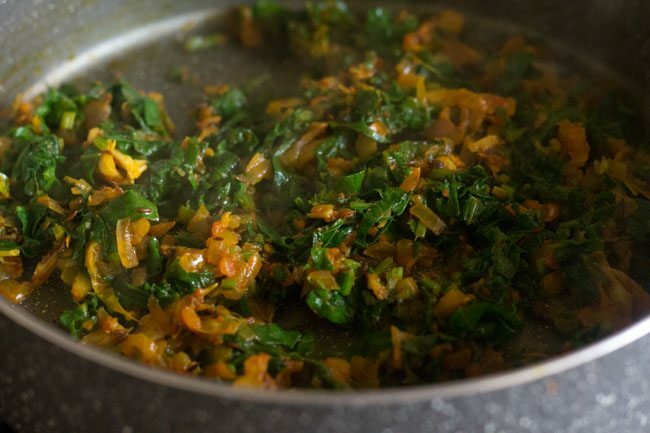 9. same way chop all the spinach leaves. 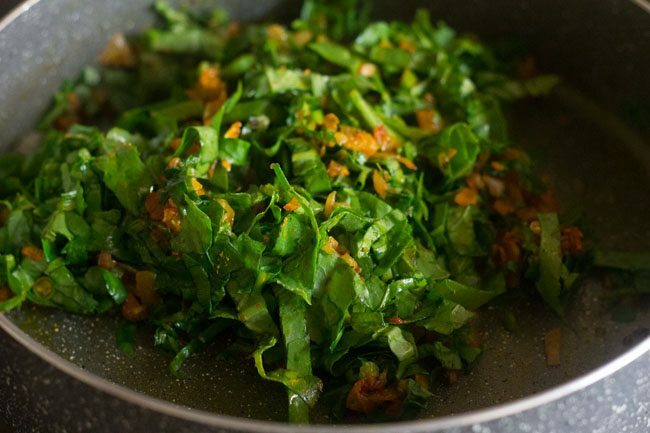 10. place the chopped spinach leaves aside. 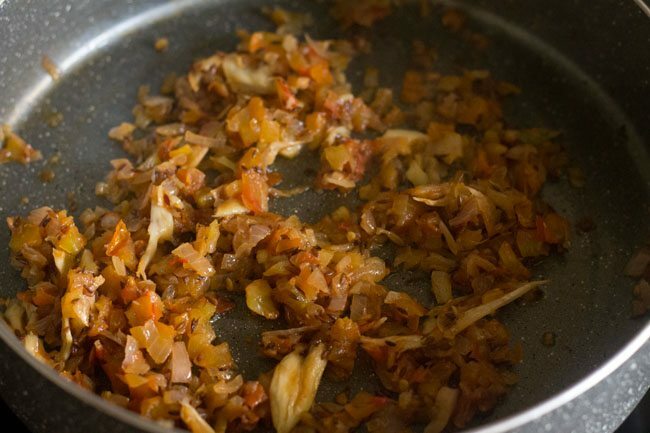 11. finely chop 1 medium sized onion, 1 medium sized tomato and keep aside. also chop or slice 1 green chili (hari mirch). 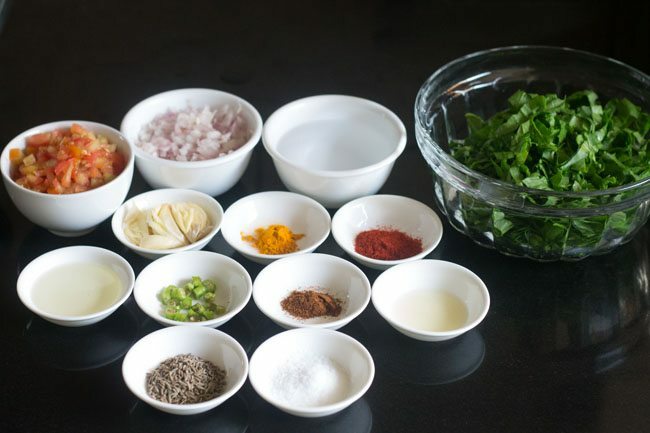 measure all the ingredients and keep ready for lasooni palak dal. 12. heat 1.5 tablespoon oil in a pan. 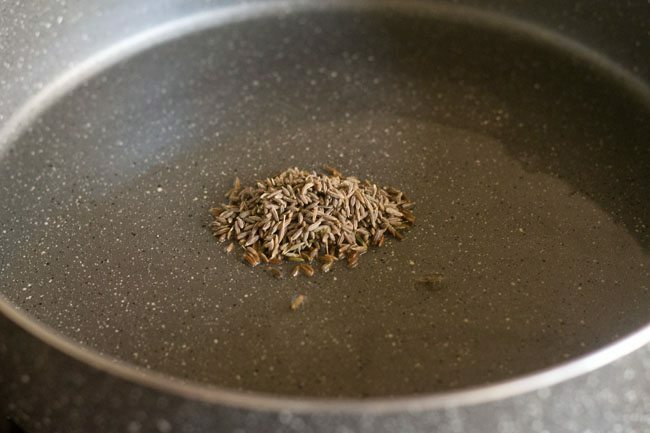 13. add 1 teaspoon cumin seeds (jeera). 14. allow them to splutter. 15. then add the crushed garlic cloves. 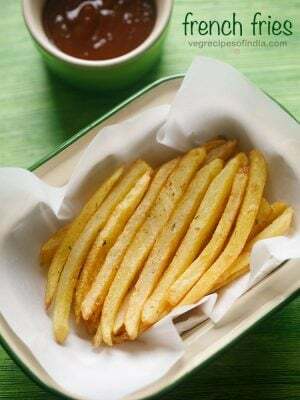 16. saute till they become a light brown. 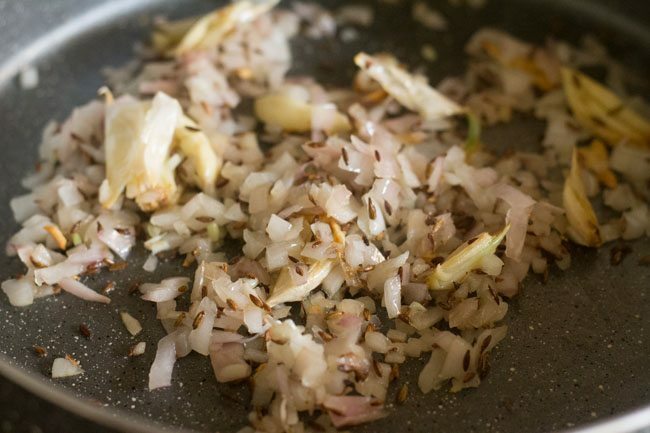 you can even saute the garlic for some seconds without making it light brown. 17. then add the chopped onions. 18. saute the onions till they turn translucent. 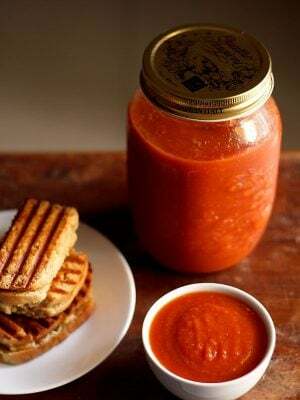 19. next add the chopped tomatoes. 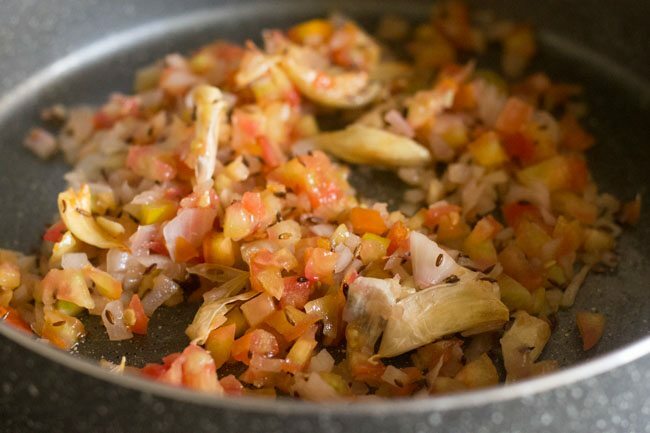 21. saute till the tomatoes become pulpy and you see oil releasing from the sides of the mixture. 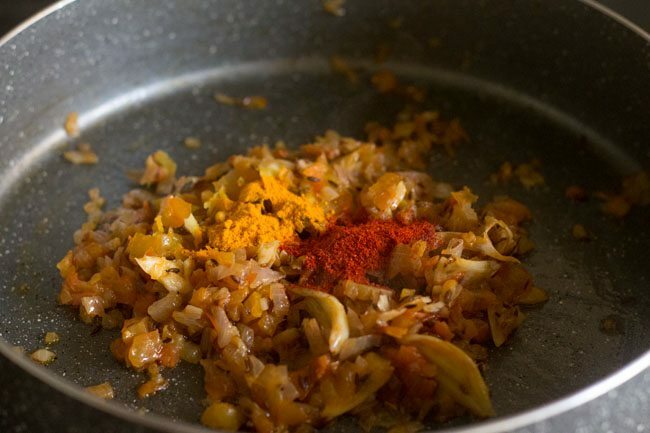 22. now add the spice powders – ½ teaspoon turmeric powder (haldi) and ¼ or ½ teaspoon red chili powder (lal mirch powder). 24. add the chopped green chilies. 25. next add chopped spinach. 27. saute on a low to medium flame for some minutes till the spinach wilts. 28. now add the mashed dal. stir well. 29. for a thicker consistency of the dal, you can stop here. for a medium or thin consistency, you can add ⅓ to ½ cup water. add water depending on the consistency you require. 30. stir very well. 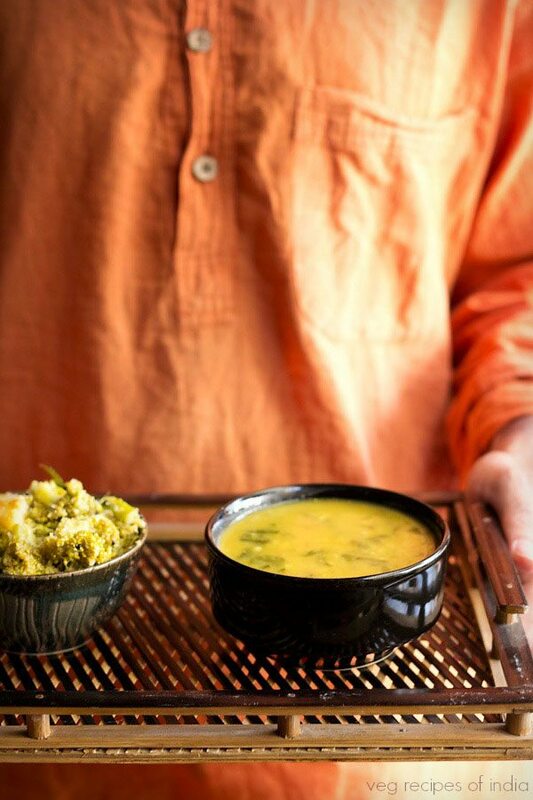 bring the palak dal to a simmer. 31. lastly add salt as per taste. 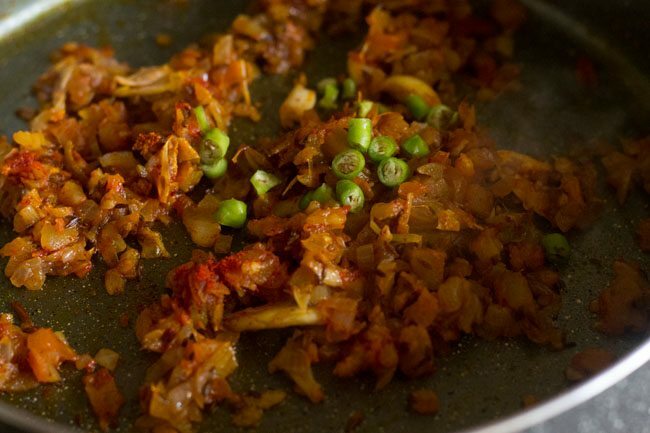 32. once the palak dal is cooked to the desired consistency, sprinkle ¼ teaspoon garam masala powder. 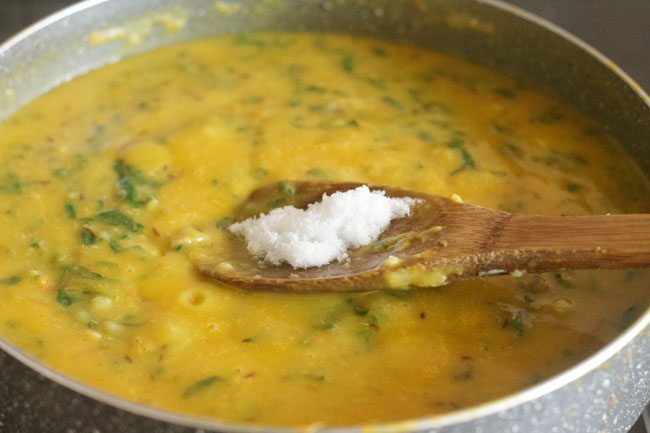 33. you can also add a few drops of lemon juice to the dal but its optional. 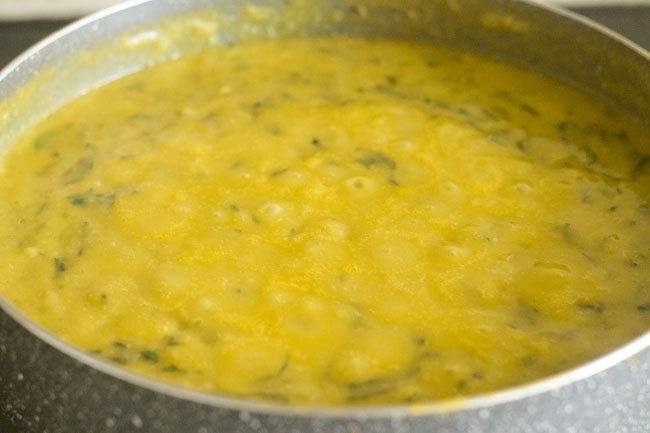 35. serve lasooni dal palak hot with some chapatis, phulkas or steamed rice.